Emily Lewis sits with one of her dogs at the Dog Training Club of Champaign-Urbana. By Jack Preis, Ralph Cooper, Sarah Soenke and Taylor Rooks/ For CU-CitizenAccess.org — According to the Humane Society, 62 percent of American households owned at least one pet 2012. While a majority of families keep pets as valuable family members, seniors citizens specifically can benefit from the companionship with these animals. Research has shown senior citizens can benefit greatly from owning pets due to the age group’s particular challenges. A study done by the Minnesota Stroke Institute reported that after following 4,300 cat owners for over 10 years, they found cat owners are 30 percent less likely to suffer a heart attack. Another report by UCLA’s Dr. Judith M. Siegel found that senior citizens who own pets visit their physicians less often than senior citizens who do not own pets, which would mean lower medical costs. Other reports show that elderly pet owners have lower levels of cholesterol, blood pressure, stress and depression and higher levels of exercise, social interaction and mental stimulation. These benefits can be witnessed even in the local Champaign-Urbana community. Several adoption shelters and community groups provide education and support for senior citizens wanting to own a furry friend. Current pet-owning seniors in the local area and experts in animal care were able to share their personal stories on how owning a pet has affected their day-to-day happiness and how pets can improve the lives of others. Bob and Emily Lewis are a retired couple that own two Golden Retrievers, Shayla and Sam — and this video captures their personal story. After retiring and sending their kids from home, their house felt empty. They previously owned a rescued Golden Retriever, but their kids urged them to get a smaller dog the next time around. However, the chemistry that they shared with their last Golden made them want to get another. And with Bob having Sam, Emily wanted one for her own. The couple appreciates the company of the two dogs on a day-to-day basis. The dogs offer unconditional emotional support and have a constant need for exercise that gets Bob and Emily out of the house. They even take their two dogs to obedience classes at the Dog Training Club of Champaign-Urbana, located at 2210 E. Ford Harris Rd. in Urbana. 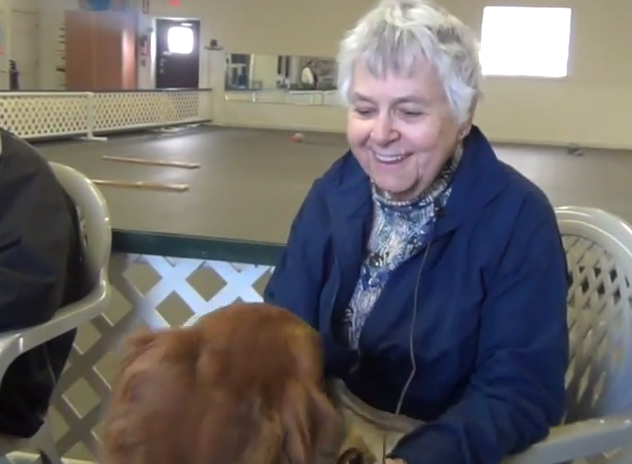 Libbie Brandt, trainer at the Dog Training Club of Champaign-Urbana, has seen the effects dogs can have on the lives of the elderly. She shared the therapeutic support her own dog gave to a bedridden woman whom had not spoken to anyone in months. This made her realize how powerful a pet can be for even individuals who are not otherwise cognitively present. Jackie McCarten, the Champaign County Humane Society adoption supervisor, shares how the Seniors for Seniors program works in this video. The program aims to unite senior citizens, age 60 and older, with a senior cat or dog that best fits their personality and needs. Cats are seven years and older and free, and dogs are six years and older and half price. This pricing encourages both the adoption of older, less desired pets as well as easier access for senior citizens to the psychological benefits of pet ownership. According to animal science Professor Sarah Albert, seniors who own pets experience many specific benefits. For example, Albert said studies show that just petting a dog helps to lower stress levels, which can help with loneliness and depression. Having a dog means having to exercise the dog, and that helps to keep the owners mobile for longer. Pets can also act as a “social lubrican.” The pet provides a conversation starter for seniors who may have a hard time interacting with others. This story was produced by University of Illinois students in Assistant Professor of Journalism Janice Collins’ multimedia class. It is part of Elderly Watch, a project of CU-CitizenAccess.org that focuses on elderly issues in east central Illinois. The project is funded by the Marajen Stevick Foundation.